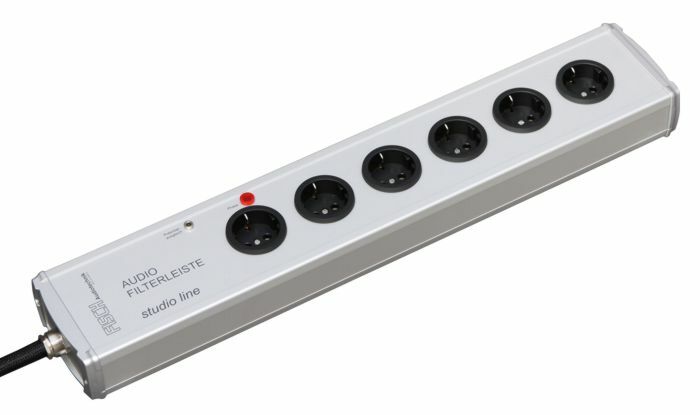 The AFL studio line does actually do much more than a conventional power bar. A symmetric input filter protects all connected components against all wire bound distortions, coming from the mains. Particular attention has been paid to keep the wiring resistance as low as possible; as this is a common attribute to all FISCH power bars. That is to ensure that the music never will be limited by any loss of dynamics. The same attention has been paid to the very high frequency range. The interference suppression reaches the gigahertz range. That is important for the attenuation of interferences coursed by mobile phone and other modern wireless services. The necessary filter technology has been adopted from our top of the line model, the “reference line”. Only the “on-site” filter technology made it possible to archive on all outlets the same high frequency attenuation. Not only are the measurement-results outstanding quality; but far more important, the gain in sound quality is impressive. Eventually it is the increase in sonic quality what counts, that is what a good power source is made for. Sophisticated technology and long time experiences are used without any restrictions to build up this power-source for high quality audio- and AV-reproduction. 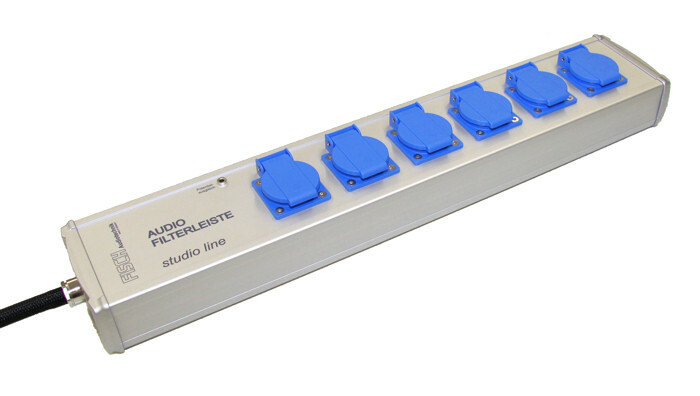 The AFL studio line is a power source for clean power, free of high frequency interference which degrades audio and home cinema equipment. In the front focus stays always the mains filter. Our own knowledge has been used consequently to ensure that every outlet is of equal high quality. At the same time, all outlets are decoupled from each other. That is the only way to keep back-interferences away from the neighbouring outlets. Not only this expensive but superior filtering technique has been developed in our own laboratory; also the production of key components is performed in our own manufacturing facilities. Trained staff ensures an accurate and consistent product-quality. The selection of parts and materials is carried out after thorough technical and tonal aspects. The internal wiring is done exclusively with OFC copper. An easy accessible grounded banana-socket is placed on the front. It can be used to ground any phono-equipment and for all test purposes. For power bars with an IEC-connector as a power inlet, a high-end quality OYAIDE plug with silver- rhodium plating is used. The housing has a major impact on the good overall result. The functional and stylish designed housing is characterized by intelligent detailed solutions. The important parameters such as electrical shielding and mechanical damping have been given special consideration. The aluminium housing is an excellent electrical shield against any kind of interfering radiation, only the consequent shielding of all current carrying parts guarantees an excellent filtering effect up to the gigahertz range. The particular design of the two halves of the housing prevents any mechanical vibrations, thereby all disruptive microphonic effects are very effectively attenuated. Only the very important team play of all electrical- and mechanical parts is a solid base for the exceptionally high quality level of this power bar. Sophisticated technical methods on all levels, from the design to the final-test facilities are used throughout. A team of skilled and enthusiastic craftsmen do guarantee a long lasting product with an always evenly high quality.